On the evening of Remembrance Sunday 2014, I arrived in Stocklinch in a cheap suit with a crumpled poppy in the lapel. It was later in the same day that I had visited Aisholt. I sat in St Mary Magdalen Church or the ‘lower’ church as it is known. Stocklinch has two churches, one is dead, one is alive. A folk tale tells of two sisters who are both in love with the vicar and have churches built for him. The ‘upper’ church is St Mary of Ottersey. Ottersey and Stocklinch were once two villages but they gradually merged to become one. The upper church fell out of use in 1973. They were the most beautiful opening words I’d heard from a stranger and right then there was nothing I wanted more than a cheese sandwich. Ros was another Church Warden. I helped her turn on the gas heaters for the evening service before walking back to her home. On the walk Ros pointed out various buildings; who lived there and had lived there before. She knocked on a few doors and completed some small errands for people. We walked past a red telephone box that had been turned into a book library. Ros’ house was beautifully cluttered and I looked through books on folk medicine and local history as Ros made tea and sandwiches. She seemed unconcerned about my reasons for being there and just nodded a head in affirmation at my request to record her talking. Ros talked about the upper church and the lower church and a painting that travelled from one to the other. She talked about her grandchildren, who she loved but had now moved away. She talked about her career in teaching. We get ready to leave for the evening Remembrance service. ‘Where did I put those keys,’ she says. ‘I just had them, oh well, never mind, one of life’s little mysteries.’ I want that patience. I want this pace of life. 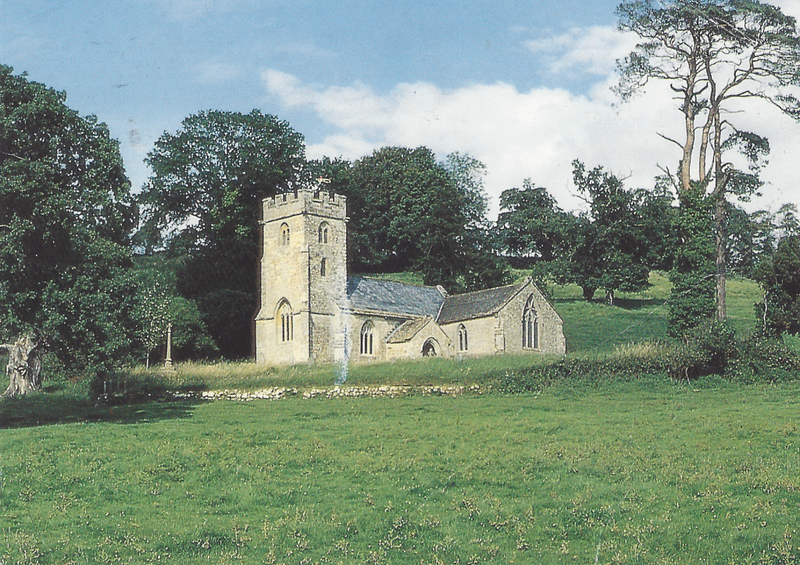 The postcard sent to me of the ‘old church’ by Ros which meant I had to return to Stocklinch. Ros turns on the lights in the church and rings the bells whilst I chat with the organist. There are eight of us in the congregation, five of whom come up to talk to me at the end. Strangers are enthusiastically welcomed in Stocklinch. The following day I painted two pictures of the phone box and sent one to Ros. She sent a postcard back of the upper church. I sorted through the recording of her words and looked at her postcard. I realised for the first time that I had missed something in this Thankful Village. I had found Ros and the lower church but I hadn’t visited the upper church. I picked up the postcard, got in my car and drove back to Stocklinch.